The only thing more adorable than one puppy being cute is five puppies being cute — and in unison. In a video uploaded to Imgur, five Alaskan Malamutes can be seen turning their heads from side to side like five aww-inducing metronomes. The result is borderline hypnotic. Malamutes are beautiful, striking dogs and many people want to have one for that reason alone. It is vital that you look past the pretty face to the type of dog who comes with it. 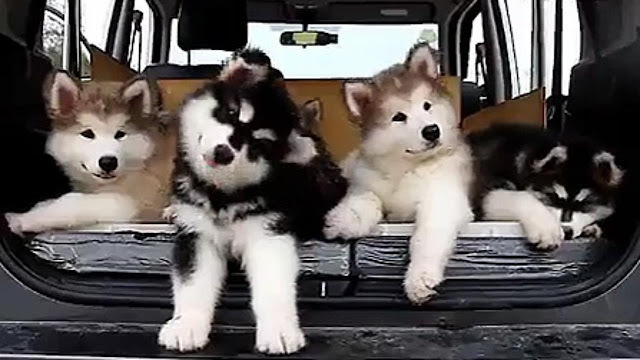 Malamutes are stubborn, friendly, independent, energetic, intelligent, dominant and possess a highly developed sense of pack hierarchy. Responses to "Just try not to smile while you watch these dancing puppies"
No way! Big smile right away! They are way to cute and lovely! I guess dancing does that... bring JOY !